High Impact Glass Windows and Doors are the latest, effortless and clearest technological advancement. Protecting your Family and Home Investment has never been so easy. Home Shields USA is a South Florida Family owned business, established in 2004 with over 10 Years in business. We have worked hard to protect hundreds of Families and Home investments, making it easier and better for the consumers to enjoy. We have gathered knowledge and experience in Hurricane protection throughout South Florida to benefit you when making a decision to invest in protecting your most valuable asset, Your Home. Our purpose is making Your Home, Hurricane proof as possible. We combine over ten years of experience, having installed Florida Hurricane Protection on hundreds of homes and businesses, residential and commercial properties throughout all of South Florida. 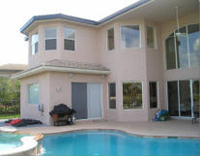 Our main priority is to protect Your Home while keeping in mind its original beauty and design. Our products are Florida Building Code approved and Miami Dade Building Code HVHZ stringent requirements: High Impact Products, Accordions, Rolling Shutters, Storm Panels Aluminum and Clear, Colonial and Bahama, because you can never be too careful. Our highly trained factory technicians have earned the highest compliments from our valued clients and Home Shields USA has earned the trust of our clients on getting the job done on time and right, always. Our goal at Home Shields USA is to provide just that: Trust, Quality products, Accuracy and best Prices. © 2009 Home Shields USA. All rights reserved.